It takes a lot of work to grow perfect-looking Christmas trees. Photo: capn madd matt. Last week, I went to buy a Christmas tree at the Cal Forestry Club’s annual tree sale fundraiser, and instead of full, lush conifers that tapered to a perfect pointy crown, I found only short little trees, with trunks that meandered left and right and branches that were sparse and uneven. These weren’t the picked-over remains—all the trees the club had sold that week resembled Charlie Brown’s tree. The Berkeley students from the Forestry Club described these trees as “free range,” in contrast to trees from Christmas tree farms, which are painstakingly grown to be perfect. Members of the Cal Forestry Club had chopped these trees down themselves, in the Sierra Nevada Mountains. The trees would have been chopped down anyway, Berkeley student and Forestry Club member Jamie Richards explained. They were growing in clumps that had to be thinned out to reduce competition between trees. Sierra Pacific Industries owned the land and donated the trees for the fundraiser. A handful of students packed 463 trees into a 24-foot U-Haul and steered it down an icy Highway 50 towards Berkeley. The trees they were selling were red firs, white firs, and incense cedars. I figured they didn’t look like typical Christmas trees because they were the wrong species. Jamie said that most Christmas trees are indeed different species—noble firs, grand firs, Douglas firs, and spruce are popular choices—but their perfect structure has more to do with the way they’re grown than their genetic makeup. On a Christmas tree farm, it takes a lot of work to get the trees to grow. The trees are “hedged” or pruned so they grow full and bushy, and their trunks are trained to grow straight. Most conifer species grow at high elevations, but most Christmas tree farms are at lower elevations; the trees need to be nurtured with fertilizer so they’ll grow in soil and weather conditions that are not the same as the conditions where they evolved. Jamie pointed out that farmed trees are not as hearty as they would be in their native environment, and they’re more susceptible to diseases and damage from pests. Tree farms must apply pesticides and fungicides to prevent damage that could turn the needles yellow and make the trees un-sellable. Depending on the species and the environmental conditions, it takes 6-10 years for a Christmas tree to grow; some of the diseases that can afflict Christmas trees don’t develop until the tree is 4-5 years old, at which point the growers have already invested a lot of work. Christmas trees came into fashion in the early 1900s. People usually chopped a wild-growing tree, until Christmas tree farms grew in numbers the 1930s and 1940s. 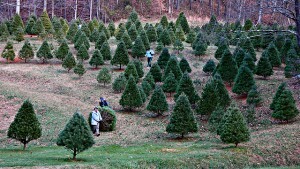 Today, 98 percent of non-artificial Christmas trees sold worldwide come from Christmas tree farms. The trees sold by the Cal Forestry Club are the two percent. They grew wild, and they look it. Nevertheless, I bought one. The tree barely reached my shoulder and had only a few branches, so it was easy take it home in the trunk of my tiny car. Once I added a string of lights and a few ornaments, though it wasn’t a perfect Christmas tree shape, it looked perfectly festive.